Self-exclusion is a process when you can ask a gambling operator to exclude you from gambling with them for a set length of time. In practice, it means you will be refused service in the venues where you have self-excluded. By law, this must be provided as an option by gambling operators in Great Britain. Responsibility for sticking with this lies with you, but you can expect the operator to do all they reasonably can to help you. Can I self-exclude from betting shops and other gambling establishments like bingo and online? This scheme covers the betting shops and as such any online accounts held with them can be suspended. We do not cover other providers. – Please see the useful links page for links that you may find useful. Call the team on 0800 294 2060. Self-exclusions are designed to match your individual needs – please be aware calls can take up to 30 minutes. Yes – to activate the exclusion, we will need a colour copy of photographic ID and a good clear up to date photograph of yourself – this can be done via e-mail or post. Once we receive your documents we notify the relevant operators of your decision to self-exclude. Please note the exclusion will be dated and activated on the day we receive your documents but that it takes a few days to get your details to each betting shop on your self-exclusion. Can I self-exclude from the whole of Great Britain? No. The scheme offers a tailored, bespoke, exclusion that will target the particular areas that are relevant to you. 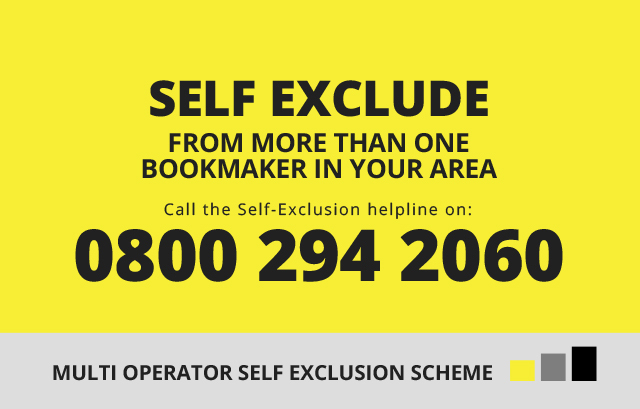 Nationwide exclusions damage the effectiveness of the scheme by increasing the risk of those who self-exclude not being recognised and consequently being allowed to gamble. How many shops can I add to my exclusion? There is no numerical limit. The limit is relevancy exclusions are tailored to reflect individual customer needs. How long can I exclude for? The scheme offers an exclusion for a fixed term period of 12 months that can be renewed at the end of the term with a phone call. Can I complete a self-exclusion for a loved one? No. Self-exclusion is voluntary agreement which must be freely entered into by the person wishing to be excluded. Why can’t I register online: why must I call-in? We believe the individual tailored exclusions are more efficiently created with a phone call where we can ensure we covered all the areas required. Your personal details are kept confidential and only shared with the participating bookmakers, their group companies’ and the central team administrators. Will I get a copy of my activated exclusion? Yes, either by post or by e-mail whichever is more convenient for you. Can I cancel the self-exclusion if I change my mind? No, once activated you cannot revoke, rescind or withdraw the exclusion prior to the expiry date. Will I be stopped from Gambling? The terms and conditions of the agreement that you will need to accept state you will not enter any of the premises on the exclusion. Should you breach your agreement the expectation is that you are asked to leave. We strongly encourage you to report to us all cases where breaches have occurred and you have not been challenged. We will then report that back to the relevant operator. What happens if I do manage to place a bet? The bet stands – win or lose. The scheme and the operators have no liability if you breach your self-exclusion, gamble and lose. What happens if my circumstances change and I need to self-exclude from different betting shops? If there is a need, you can add additional premises to your exclusion at any time, by calling the team on 0800 294 2060. Do I need to have a list of my relevant areas when I call? No. You can add premises to your exclusion at any time, by calling the team. Please be aware we do not accept e-mail additional premises request. Is self-exclusion I the same as being barred? No. Self-exclusion is a voluntary agreement that you enter into. You agree not to enter the premises listed on your exclusion. It’s up to you to make it work. Will you contact me when my exclusion is due to expire? No. The exclusion goes into a period of review for six months. During this time the exclusion remains in place unless you notify us of a wish to return to gambling or you tell us you wish to renew your exclusion for a further year. We manage these requests on 0800 294 2060. Will it take 30 minutes on the phone every time I want to renew the exclusion? No, the details of your tailored exclusion will already be on the database. The renewal call can be brief. If I do nothing when the exclusion expires can I then gamble in the betting shops I listed? No. we and the betting shops will assume you wished to remain on the scheme if you did not notify us of your wish to return to gambling. If you do not choose to renew within six months of the end of the exclusion the arrangements will then lapse and operators of betting shops will remove your self-exclusion from their records. In addition to registering a person’s initial wish to self-exclude we can add premises to an existing self-exclusion, we can renew a self-exclusion when it has been in place for a year and we can record any notifications of a wish to return to gambling after the year of self-exclusion has expired.